European Gaia spacecraft’s first major data dump — the most detailed 3D chart yet of our Galaxy — will keep researchers busy for decades. After a feverish wait, astronomers around the world have an ocean of new information to throw themselves into. 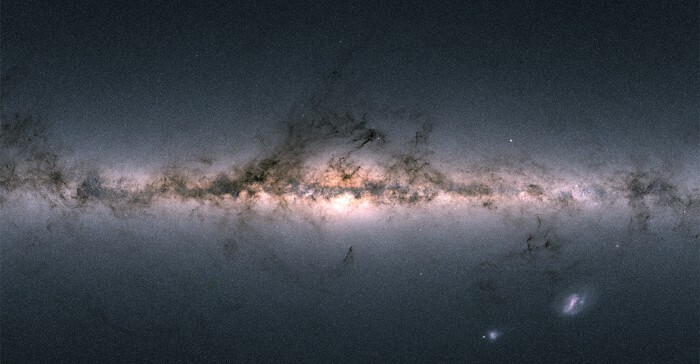 On 25 April, the European Space Agency’s (ESA) Gaia mission published its first fully 3D map of the Milky Way. Within hours of the catalogue going online, 3,000 users around the world had already started downloading the data, ESA said in a tweet. “We’re very curious to see what the community will do with it,” says Anthony Brown, an astronomer at the Leiden Observatory in the Netherlands who chairs Gaia’s data-processing collaboration. 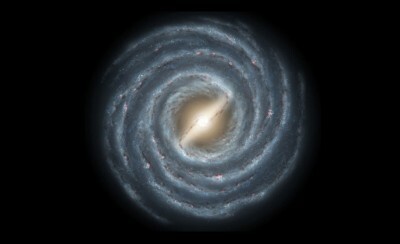 A﻿t an event to present the Gaia catalogue at the Royal Astronomical Society in London, astronomer Gerry Gilmore of the University of Cambridge, UK, presented a striking video that extrapolated from the Gaia data to simulate the future motion of millions of stars. “Everything moves,” he said. The 2-tonne Gaia spacecraft, part of a﻿ €1-billion (US$1.2-billion) mission, launched in late 2013 and began collecting scientific data in July 2014. Gaia is in stable orbit that remains fixed relative to both the Sun and Earth. 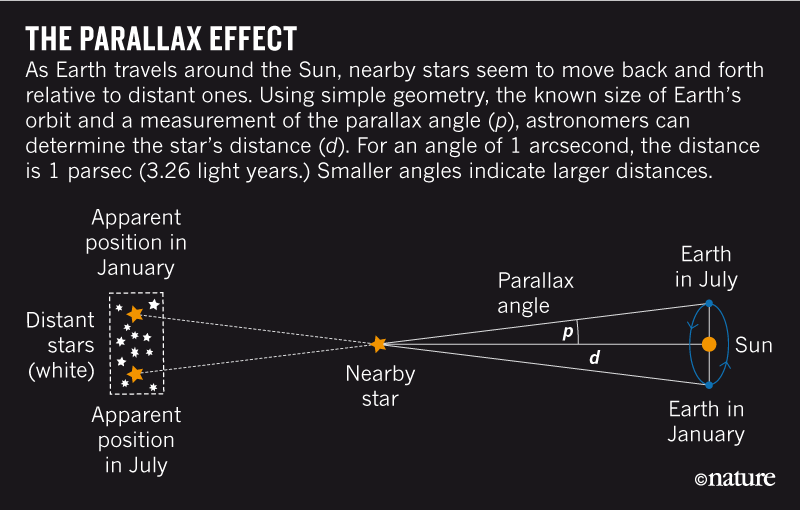 It makes repeated measurements to estimate the distances of stars — and other celestial objects — using a technique called parallax (see ‘The parallax effect’). Alongside its 551-gigabyte database, the Gaia team also released a number of scientific papers. The main goal of these was to describe quality checks the researchers did on the data and demonstrate how they can be used; the mission’s policy is to make the catalogue immediately available to the broader community, rather than reserve it for the team’s own science studies first. Still, the Gaia papers describe a wealth of original findings, said Floor van Leeuwen, another senior Gaia scientist from Cambridge, at the press briefing. He shows, for example, how Gaia proved for the first time that certain star clusters puff up at the same time as large stars sink to their centres. “We weren’t allowed to make discoveries, but we couldn’t avoid making them,” he said. One of those findings has implications far beyond the Milky Way. Some astronomers are especially eager to see Gaia’s measurements of certain types of variable star that are used as ‘standard candles’ of cosmology. Knowing the precise distances of these stars in the Milky Way makes them useful as yardsticks for measuring distances to galaxies much farther away. In particular, astronomers use standard candles to estimate how fast the Universe is expanding, but in recent years, measurements based on this technique have been in apparent contradiction — or “tension”, as scientists say — with predictions made using maps of the cosmic microwave background (CMB), the afterglow of the Big Bang. A preliminary look at the data shows that Gaia has improved the precision of the standard-candle measurements, Gilmore said at the press briefing. But, he adds, “at face value, the tension is still there”. Dozens of preprints are likely to appear in the next few days, Gilmore says, as teams around the world download Gaia data and run them through algorithms honed for years in preparation. For example, researchers will be able to test models of how the Milky Way formed through mergers of smaller galaxies; measure the distribution of dark matter; and refine their theories for how stars evolve as they burn through their reserves of nuclear fuel. Denis Erkal, an astronomer at the University of Surrey in Guildford, UK, and his collaborators plan to use Gaia data to weigh the Large Magellanic Cloud, the largest of the dwarf galaxies orbiting the Milky Way. They will do so by measuring tidal motions in our Galaxy’s stars that are caused by the dwarf galaxy — a bit like weighing the Moon by measuring its effects on Earth’s oceans. 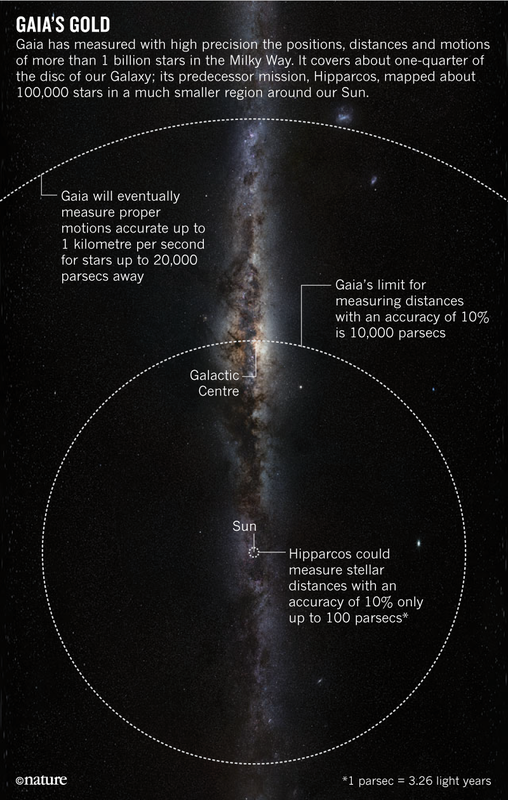 Gaia released a preliminary catalogue in 2016, but at that time, it had not yet gathered enough data to directly measure the distances of many stars. Further data releases will contain more and more information and will enable entirely new kinds of studies (the next release will be in 2020). Some researchers expect to discover tens of thousands of exoplanets by watching stars wobble under their planets’ gravitational pull — but the probe must collect several years’ more data for these motions to become apparent. Others will inspect similar wobbles in search of evidence of the passage of gravitational waves. In addition to tracking stars, the probe has monitored asteroids and will help scientists to monitor bodies in the Solar System that might look to be on a collision trajectory with Earth. A technical glitch in February temporarily sent Gaia into ‘safe mode’, but the probe is in overall good health, says project scientist Timo Prusti at ESA’s European Space Research and Technology Centre in Noordwijk, the Netherlands. If nothing breaks down and ESA continues extending the mission, Gaia has enough fuel to keep operating until 2024, for a total of 10 years, he says.